There are plenty of things you can do with a barebones system such as Shuttle's SX58H7 case-PSU-motherboard bundle. Buy a powerful, reasonably priced CPU such as the Intel Core i7 930 and a budget 3D card and RAM, and you get one formidable workstation or media centre. Those eight threads across four cores on the 930's die will chew through processor-intensive applications and rendering tasks like a beaver through balsa wood. Alternatively, whack in a decent DX11 card, match it again with an affordable Core i7 and triple-channel, low-latency DDR3 RAM and boot up a very capable gaming or Photoshop rig. Watch the size of your memory modules though: there's little headroom between the RAM slots and overhanging storage bay. What almost no one would think to do with this diminutive desktop case, though, is fill it with top-of-the-line components for maxed-out gaming. But it is possible. The Shuttle SX58H7 motherboard inside supports any member of the Core i7 9xx series gang, including Intel's most powerful CPU, the 990X Extreme Edition. Struck dumb by such a prospect, we had to stick one in there. And what better graphics card to pair with such an extreme processor than Nvidia's GTX 580? Well, the Zotac Nvidia GeForce GTX 590 perhaps, but it wouldn't quite fit. So the 580 it is. In fact, AMD's king-size 6 series cards, such as the Radeon HD 6790, are out of the question here too, such is the compact nature of the interior. Gazing inside reminded us of the shoebox apartments in Tokyo that Philippa Forrester always seemed to cram herself into on Tomorrow's World. Welcome back, obscure TV memories. There's an inevitable amount of fiddling involved in actually building a system inside the Shuttle SX58H7, particularly fitting the GPU's PCI-e power connectors beneath that aforementioned storage bay of fiddliness. Elsewhere the layout is inspired, though – everything that can be has been tucked away, and everything you need is at hand. Temperature's an issue in such a cramped space, though. Apparently the thin, flat vapour-chamber heatpipes of the I.C.Evo CPU cooler work better than copper pipes. We found in reality that it's fine with low-end CPUs, but not quite the 990X for long-term usage. For testing we stressed this case with a higher spec than most would attempt. At the limit of its capabilities, the Shuttle SX58H7 runs the hardware cool enough to prevent instabilities. However, load temperatures for CPU and GPU were higher than anyone who'd just spent £1,300 on two components would like. At temperatures of 74C (165F) the CPU isn't going to set itself on fire, but it won't live as long as it would in a larger cooled case. It's a wondrous thing to see a machine smaller than R2-D2's rucksack running DirectX 11 games at 50fps. Things start to get a little too hot for comfort when the GPU and CPU are stressed for any length of time. With slightly lower end parts, temperatures shouldn't be such an issue, but that does defeat the point. For gamers with realistic budgets, it's a great place to start a system that'll fit anywhere, and as a workstation it's ideal. USB 3.0 and SATA 6Gbps would be nice at this price, which seems steep considering there's no CPU, RAM or storage included. The growing presence of Sandy Bridge Mini ITX motherboards casts a further shadow over this barebones deal. 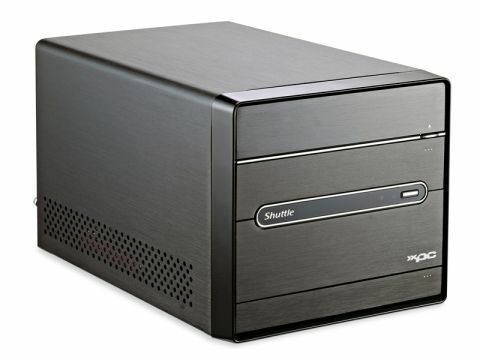 But if you're smart with how you use it, this Shuttle SX58H7 could be just the ticket.